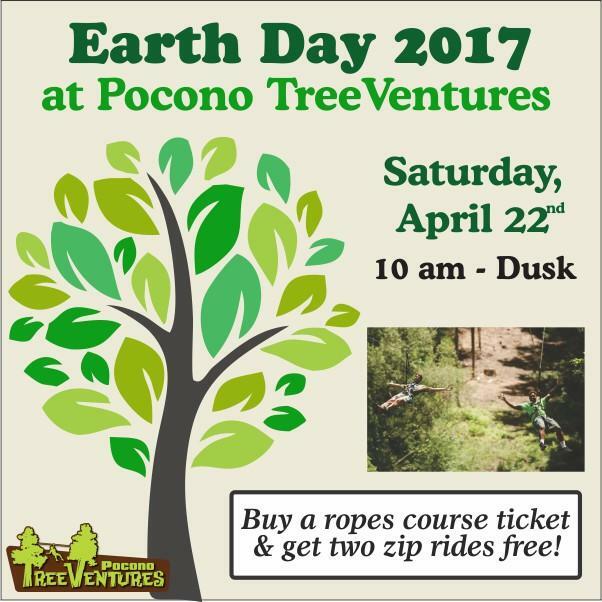 When you purchase one ropes course ticket for Pocono TreeVentures, you will receive two zips on Pocono Zip Racer for free on Earth Day, Saturday, April 22, 2017. Bertucci continues, “For a great day of fun, start with spending time in the ropes course then enjoy two complimentary zips on our dual racing zip lines. Climbing through the trees and zipping through the sky is a unique way to celebrate Earth Day.” In addition to receiving two complimentary zips, each guest will be given a packet of wildflower seeds to plant and help the butterflies. Pocono TreeVentures contains courses made of platforms constructed at various levels in the trees that are connected by different types of bridges that represent obstacles. Participants maneuver from platform to platform wearing a safety harness. It is located on Route 209 in Bushkill, PA on the property of The Villas at Tree Tops and Fairway and Fernwood Resort. In addition to TreeVentures, there are two KidVentures courses for children ages 4-7 and the Pocono Zip Quest 9 zip line experience that takes you over buildings and trees, makes spending time in the trees an even better experience. For information about Pocono TreeVentures and our Earth Day celebration, go to PoconoTreeVentures.com where you can get additional aerial ropes course information and Earth Day details. Tickets must be purchased in person in order to receive the Earth Day special. Pocono TreeVentures is open from noon to dusk Fridays, and 10:00 am to dusk Saturdays, Sundays and holidays throughout April.